Are you interested in cosmetics? If you are cosmetic-crazy, you recognized already there are many cosmetics brand in Korea. If you are not “crazy”, you would see some cosmetic stores on the road at least one time. That brands are cheaper ones in cosmetics market. Today, I want to introduce some brands which are popular among them. And there are too many products and they have too different quality among the area of products (ex. shadow, lips..)to choose one so I recommend their best products to help choose best items. 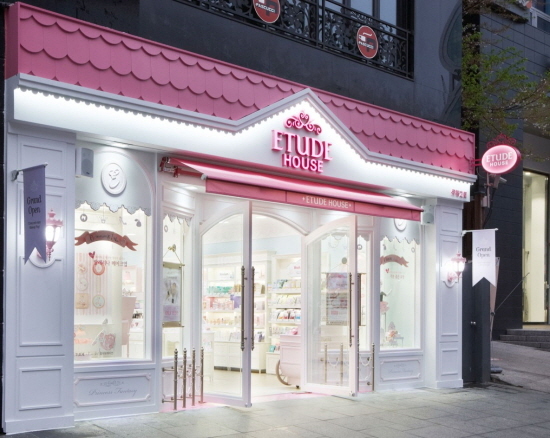 When you walk on the street and see really pink store like young girls’ doll house, it might be Etude. Etude house’s characteristic is “pink”. They think their customers as a “princess”(OMG..) Anyway, Etude is very popular brand among cheap cosmetic brands. At the first time they launched, usually teenagers use them because of price. However, recently, their products’ quality is quite good. So, various age groups use them now. Especially, Shadow is their best products. Among cheap cosmetic brands, Etude’s shadow is one of the best products. Their shadow’s color is very various. Their color-development on skin is quite fine. Though it is depending on skin color and type, many people said color-development of Etude shadow is good. The most important thing in shadow is erasing or smudging after make-up. As you know, the shadow which has glitter usually smudge around eyes. However Etude’s shadow is on the no-bleed side. If Etude is pink, Innisfree is green. They emphasize natural atmosphere. There are many brands which emphasize natural, for example, ‘Nature Republic (네이처리퍼블릭)’, ‘THE FACE SHOP (더 페이스 샵)’, etc. However Innisfree is the most popular between them. Among Innisfree’s products, skin care is the best. Innisfree’s makeup area is not bad as well. It is similar level with other cheap brands. However, skin care area is one of the top brands. Especially, there is a product that is made of special volcano ash which is called “Hwa san song e (화산송이)”. from jeju. 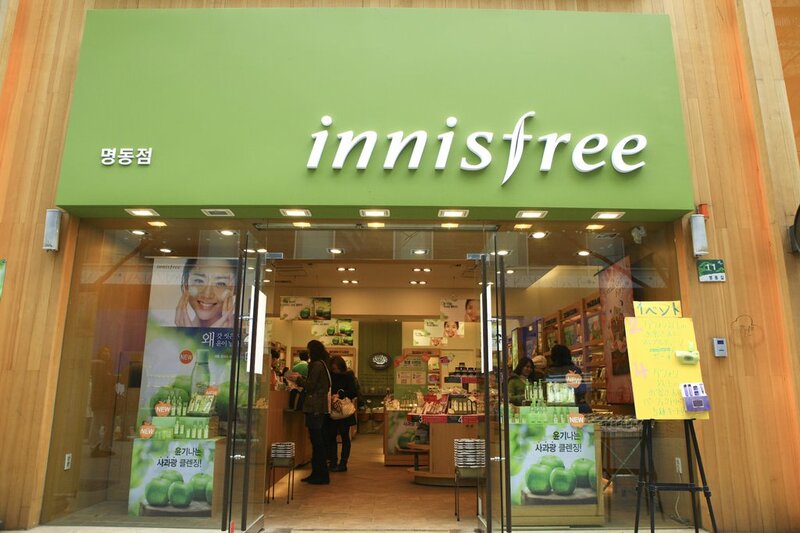 It is the representative product in Innisfree. If you need skin care products like skin, lotion or cream, go to Innisfree. ARITAUM (아리따움) means “beauty” in Korean. 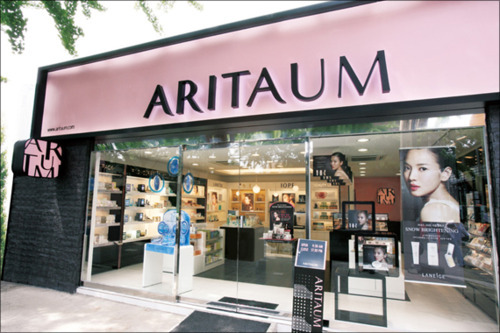 In ARITAUM stores, there are ARITAUM products and also IOPE’s products like IOPE, Mamonde, LANEIGE, etc. Even there are perfumes. You probably know this, but IOPE’s air cushion products are very popular which are used when wearing base makeup. Unfortunately, I’m not sure there are products, which fits your skin tone. Moreover, ARITAUM is popular in nail polish and shadow. The nail polish’s brand name is MODI. MODI’s color-development on nail is very good. Especially, MODI’s brush is properly strong and it doesn’t make brush line that makes nail less pretty. Meanwhile, shadow is best and it makes ARITAUM’s today popularity. It is very similar color development with other expensive brands. Of course, there are many cheap brands and they have their own best items. However, these three brands are the most popular ones and they have outstanding quality for price. There are one more amazing news for you. They always have sale promotion every month even they are already cheap. The days of sales are different with each brands but it is almost same. But there are no fixed dates. Every month, they change it. If you have Kakao application, find them on “plus friend” category. When they proceed sale promotion, they will send message to you. And don’t forget to join their membership. Because mostly their promotions are for their membership customers. The way to join it is simple. Download their application and join it! And Have a good shopping. « What’s at the Fifth Floor of the HIT Building?